When I attended classes to earn my ESL endorsement, one of the first ELL-friendly strategies I learned was to employ graphic organizers. However, teachers who use graphic organizers with their students will attest to the fact that graphic organizers are beneficial tools to use with ALL students, not just English language learners and students with disabilities. Why are they such powerful tools? Graphic organizers provide visual representations of cognitive processes. These visual cues help students organize concepts in a way that will aid in retention. Students can actually SEE relationships and connections between facts and concepts. Graphic organizers improve comprehension. Students are able to break down bigger concepts into smaller, more understandable chunks of information. Graphic organizers increase student engagement. When filling out a graphic organizer, students are actively participating and contributing to the learning process. Because of these benefits, I like to use graphic organizers and other visual cues often in the upper elementary classroom. When I stop to picture the graphic organizers I use throughout the school year, the first one that comes to mind is my main idea ice cream cone graphic organizer. It immediately brings a smile to my face (I must admit, I DO love ice cream! ), and students seem to enjoy it, as well. After the ice cream cone graphic organizer has been introduced, you can use it across subject areas by creating an anchor chart. What is the best feature of this anchor chart? It's reusable! As you can see, I use large sticky notes (the ones shown are 8 inches by 6 inches) so that the anchor chart can used again and again! Once you have the anchor chart made, you can easily use it during social studies and science lessons. After reading a section from a textbook, you can have your students help you determine the main idea of that section, along with three important supporting details. 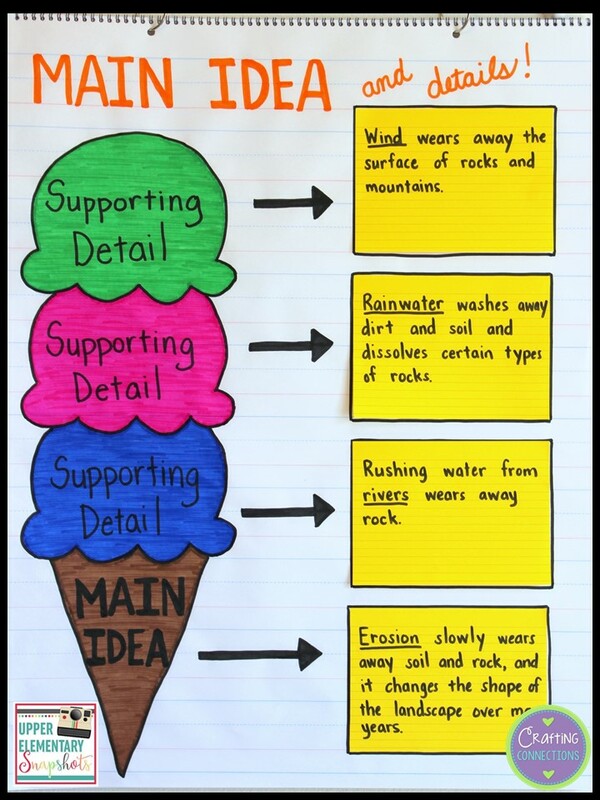 This completed anchor chart is the result of reading a section about erosion from a science textbook. 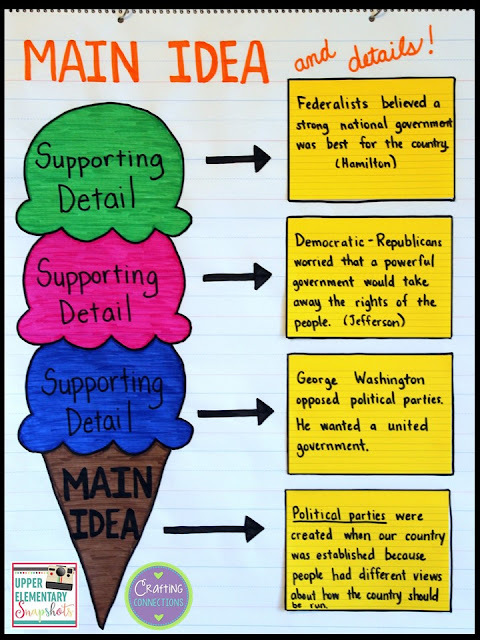 This completed anchor chart is the result of reading a section about how political parties were established in America from a 5th grade social studies textbook. As an added bonus, I created a student version of the anchor chart. You can give each student a copy to keep in a folder. 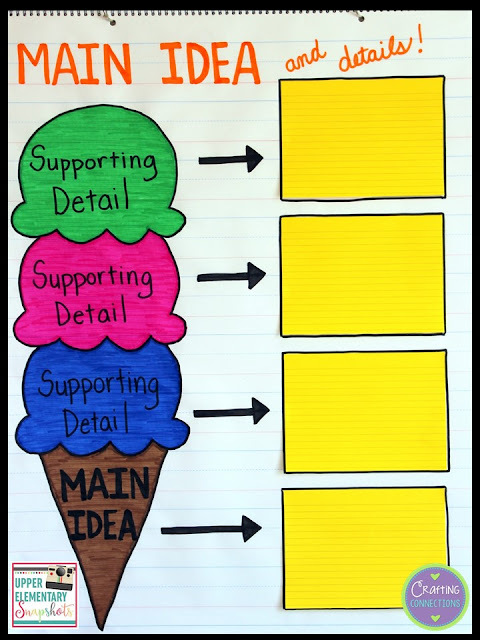 Then, when you want students to fill out a graphic organizer with you, simply distribute four standard-sized sticky notes to each student. Now they can complete the graphic organizer with you! Are you looking for additional upper elementary resources that address the concept of main idea and supporting details in a student-friendly way? 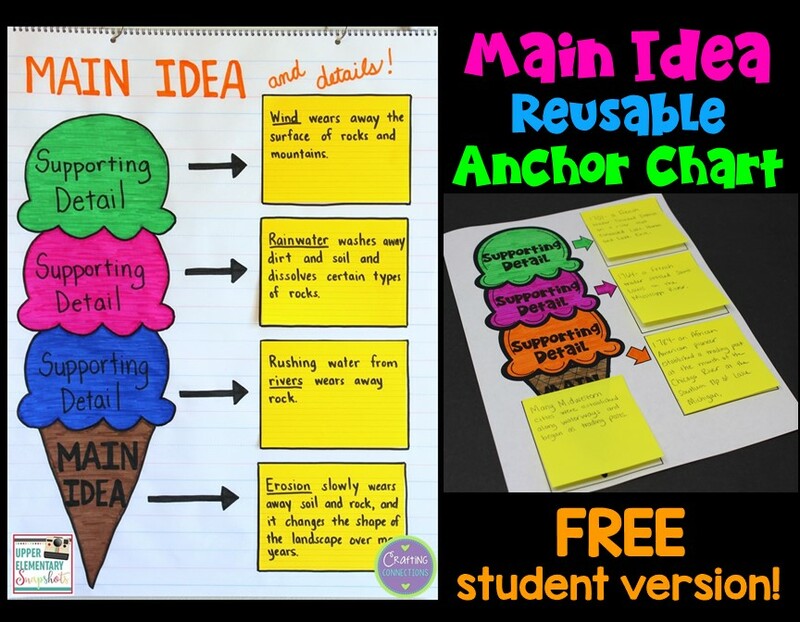 Check out my main idea bundles, that build upon the ice cream cone analogy! 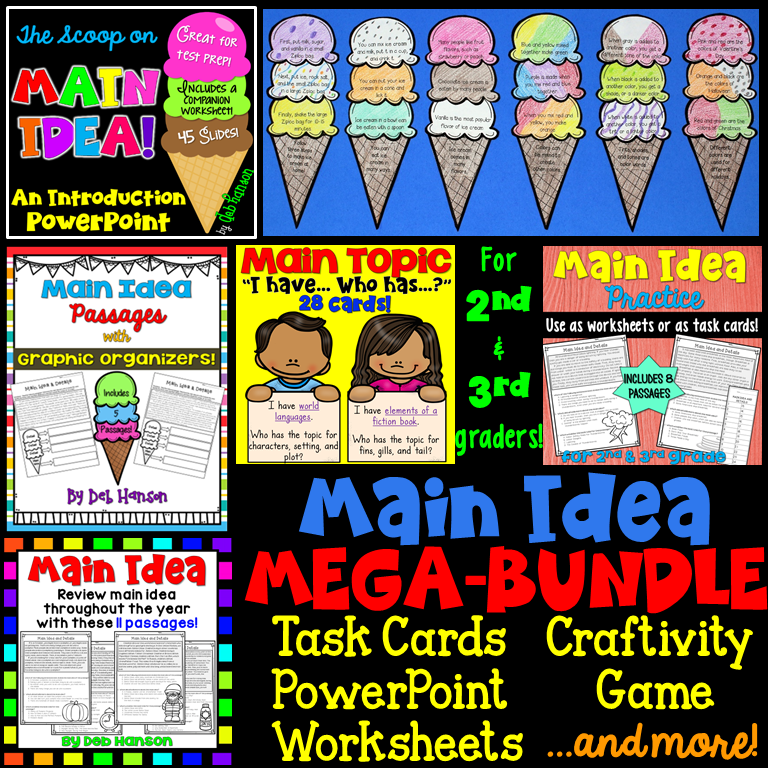 This bundle is designed for 4th-6th grade students. 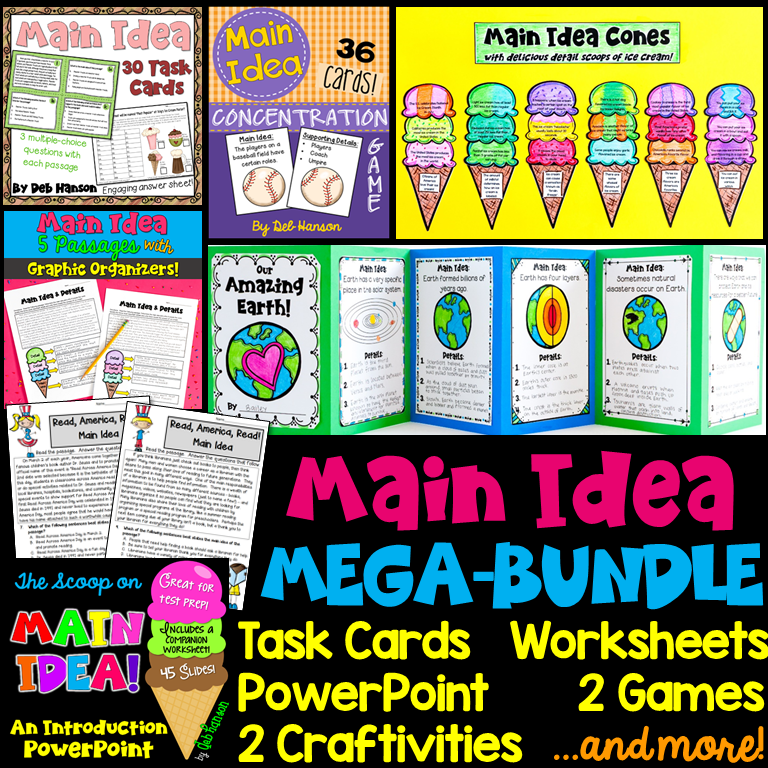 This bundle is designed for 2nd-3rd grade students!